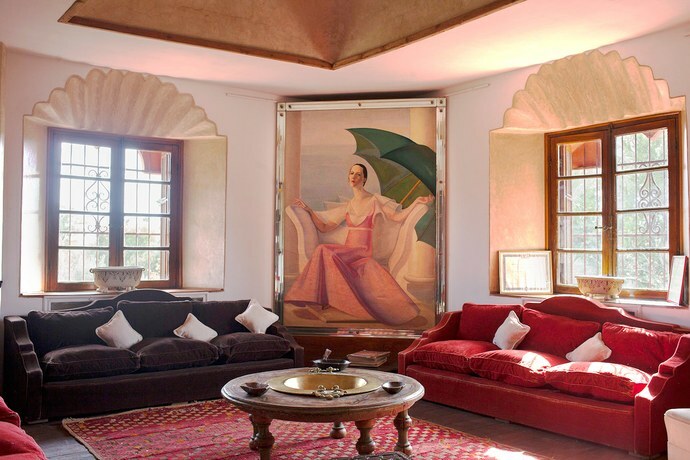 Arguably the most famous Marrakech villa in the Palmeraie is up for sale and we can report there is no other Marrakech real estate opportunity to match it. It’s a total one off. The house has seen it all – and has had a life like few others. The was one of THE Marrakech party houses. This was one of the Meccas in the Marrakech heyday – and everyone and anyone – and a fantastical crowd was always there – hosted by the ever wonderful and superbly generous hosts and owners – a renowned mosaic artist and super charming ambassador. Sadly only one of the owners is still around. He is a delight–and full of tales and humor.The house was ten years in the planning and is a design classic that has featured prominently in all sorts of publications such as Moroccan Interiors by Lisa Lovatt-Smith. It is unique and quirky–and meandering–and unconventional, a total architect’s fantasy–right out of an orientalist love for Moroccan architecture–situated in two hectares of lush verdant gardens. Though the house is totally quirky, incredible detailing has gone into its design. It is an ecological master piece, so ahead of its time. From its self-perpetuating irrigation system in the garden; to the air channels that circulate air in the chimneys and walls to maintain brilliant natural heating and cooling in the 80cm thick mud brick walls. 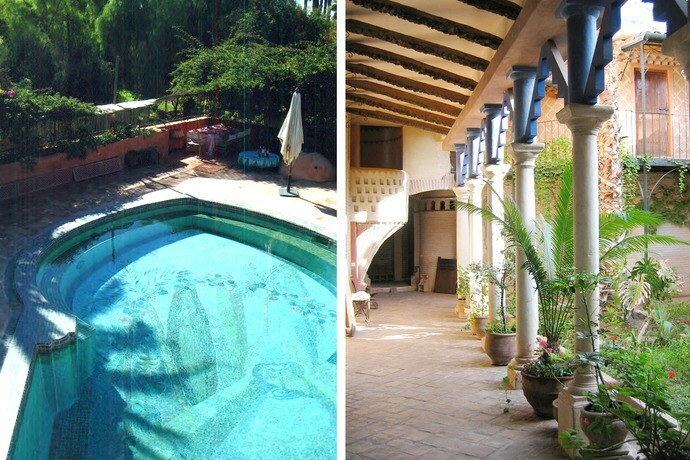 The house was designed by Zaira de Olivera and the late renowned ecological solar engineer Dominique Michaelis. There are so many points of note – for example the camel house-–as there used to be a camel called Jamila–named after a Moroccan princess–-and a camel track for racing. Even Mick Jagger had had a go. Then the columned entrance that is the perfect copy of Rome’s Palazzo Spada and its masterpiece of forced perspective of optical illusion by the Baroque architect Francesco Borromini. There even is a proper maze in the gardens. The house itself is a warren with nine stylized rooms, each slightly mysterious and all full of fun features and decoration. It needs to be seen to be believed. The house boasts guardian accommodation at the entrance, a specially engineered tennis court for effective drainage, a croquet lawn, a hectare of wild garden and a camel park, stables and a camel house, an original olive press, an olive grove with over seventy mature trees, a leafy drive, covered parking, a maze, various gardens, a Balinese cottage that doubles as a guest suite, an office with a rear veranda, a kitchen slash live in dining room with a rear veranda, a staff bedroom, the proper kitchens, a utility room, lots of storage, nine unique stylized bedrooms and five salons, a colonnaded patio with a garden and a bhou, a triple salon-–with a harem gallery, a heated first floor swimming pool filled with mosaics, a winter salon by the pool, a jacuzzi terrace, a summer salon, a winter salon, and an array of terraces and balconies. The price is 1.9m €. For more information or to schedule a visit e-mail fvreeland@gmail.com or call 011-212-696194754.